We are only satisfied when our customers are! Here you can see a selection of the most beautiful compliments we have received from happy customers. On behalf of the entire Team Rauscher team, we would like to thank you very much for the confidence you have placed in us. Well done! Even if it took a while, Team Rauscher found the right buyer for my apartment. Peter Scharfetter, together with the entire team, worked very professionally. I enjoyed the all-round service: I didn’t have to worry about anything. Mr Scharfetter was also present at the handover, so that everything ran smoothly and without complications. I would certainly recommend you! Team Rauscher was great. Mr Scharfetter did a valuation of our house and provided expert advice. We were 100% sure we wanted to sell through Team Rauscher. Everything went according to plan – as discussed with Mr Scharfetter. We didn’t have to lift a finger and the sales team was always very friendly. Thank you for making everything go so smoothly. We’re glad that everything has been taken care of. The sale took a while, despite concentrated efforts, but eventually Team Rauscher was able to find the right buyer. Thank you for your commitment Ms Reiter! Our beloved house became more and more of a burden in the past years. After all, a house and garden have to be maintained! Team Rauscher really did a great job. Mr Scharfetter and the entire team took care of everything. Everyone was so friendly and helpful. Thank you! “Our own place and more space!” were our requirements and thanks to Team Rauscher they have become reality! Our advisor, Mr Kaufels, found exactly what we were looking for. We will soon be moving into our ultramodern top-floor apartment – our children can’t wait to have their brand new rooms. It all went so smoothly! After numerous years in rented accommodation we decided to look for a place to buy. Thanks to Team Rauscher and Ms Geiger we swiftly found our dream property. We will be moving into our brand new family nest in the coming months and cannot wait to enjoy next summer in our very own garden! Professional and great to work with! Our expectations were definitely met. Mr Scharfetter and the sales team provided excellent support for the sale of our apartment and Ms Freinek gave us sound advice for the purchase of our new apartment. We thoroughly enjoyed working with you! I am really happy with Team Rauscher’s great work! Peter Scharfetter took care of everything and the sales/marketing team was very professional. The difference between Team Rauscher and other agencies was clear from the very beginning. I thought the monthly reports were great! They kept me up to speed with how the sale was going. Thank you for the brilliant result and charming service! We were very happy with the service and definitely recommend Team Rauscher! We found a 3-room new-build apartment in Parsch and received excellent advice from Mr Kaufels. Based on the plans and viewings of the shell structure, he was able to accurately describe what the apartment would look like. We know we have found our dream home and can’t wait to enjoy quality time in the garden! Thanks to Team Rauscher we have found our dream home! Mr Kaufels found exactly what we were looking for: a beautiful terraced house in leafy Koppl. He perfectly captured the feel of the place in his descriptions and a new build has the advantage that your own ideas can still be included in the design and fittings. In a few months we will be moving into our brand new home – we can’t wait! We had been looking for a beautiful 4-room apartment and thanks to Team Rauscher’s help, found one very swiftly. From the first viewing to the signing of the contract excellent, well-organized service was provided. A big thank you to the entire team and to Mr Kaufels in particular for his professionalism and sound advice. It all worked out beautifully! I felt I was in good hands with Mr Kaufels, who met my expectations with this brand new 4-room apartment. Communication with the property developer regarding small changes in the fixtures and fittings was also done very professionally and effectively. I already feel quite at home in my new place! Ms Schafhauser: I am really glad that Mr Scharfetter provided such good advice. My apartment was sold to a lovely family within no time at all – it all went so smoothly! Family Ostermann: the apartment is ideal for us and we cannot wait to move in! Thank you to Team Rauscher for the professional service. Great job: after a non-binding first meeting with Mr Scharfetter I made my mind up that I wanted to work with Team Rauscher. Beautiful, highly professional sales and marketing material was created and numerous already existing clients were informed. The sensational result: the house was sold to a couple within just one week! To top it off, the buyers are also very nice people! Thank you to the entire team for this success and the great service. I originally wanted to sell my property privately and put it online. However, I found some viewings unpleasant and burdensome. Mr Scharfetter’s call came just at the right time and I felt we were on the same wavelength. Team Rauscher’s large client database speaks for itself: my apartment was sold within 6 weeks. Great job! We are thrilled! We highly recommend Team Rauscher. Peter Scharfetter was our agent in the sale of both our apartments. We opted exclusively for Team Rauscher on recommendation from friends. Both apartments were sold quickly, thanks to the efforts of the dedicated and highly professional 5-person sales team. It was great that we didn’t have to do a thing. A happy ending: we also bought our new house through Team Rauscher. Karl Henzinger stuck closely to our requirements when choosing properties to show us and took care of everything. Thank you to the entire team and keep up the good work! In a nutshell: I am delighted! Maria – thank you for your commitment – it all worked out beautifully! It all went smoothly. Mr Scharfetter dropped by to advise us and valuate our property. I was quickly convinced that Team Rauscher Immobilien and its excellent sales team would be the best choice for me. Mr Scharfetter took care of the preparations and organisation – the sales team was very committed! I am delighted! Thanks to Team Rauscher my apartment has found a great new owner. I didn’t have to do a thing and the whole sales process went beautifully. I knew Team Rauscher from my search for property and all I had to do was call for advice on what to do with my current apartment. Peter Scharfetter carried out a non-binding valuation and once I had found the right new place for myself I exclusively hired Team Rauscher to sell my old apartment. Thank you to Mr Scharfetter and the entire sales team! Ms Wippel (photo): Everything went beautifully. Mr Scharfetter from Team Rauscher took care of the entire sales procedure, prepared everything and organised things internally with the sales and marketing teams. I am really delighted that my apartment was sold to such a nice lady within only 2 weeks. Ms Neuhofer: I am happy. Mr Henzinger from the sales team knew exactly what I was looking for, took excellent care of me and gave me expert advice on all matters. Congratulations to the team for this superb result! I have known of Team Rauscher for a while, which made choosing a good real estate agency easy. Following a consultation with Mr Scharfetter, I was 100% sure of my choice. The apartment was sold to a registered client within a week. I am happy to recommend Team Rauscher! Team Rauscher is GREAT! We have always wanted a house and decided to make this dream come true by selling our two apartments. Mr Scharfetter and the sales team took care of everything. The sales procedure was superbly organised from A to Z. Team Rauscher’s database of people looking for property meant that a happy buyer was found in just a few weeks. A huge advantage of Team Rauscher is that 5 sales professionals took care of the marketing of the apartments. We are happy to recommend you! Team Rauscher is great! Everything went so well. It started with a non-binding valuation that was carried out by Mr Scharfetter and was swiftly followed by our decision to opt exclusively for Team Rauscher. Subsequently viewings with pre-selected clients took place and we didn’t have to do a thing. The apartment was sold within 6 weeks. We are over the moon. Thank you to the entire team! I am absolutely thrilled about my new apartment in Siezenheim and the service I received from Team Rauscher: Mr Feichtinger didn’t drag me to every apartment possible, but really thought about what I would like and selected accordingly. Only a few alterations here and there and the flat will be perfect. I highly recommend the friendly team! I’m really happy that Team Rauscher found such a likeable buyer for my apartment. It had originally been intended for my children, but as they are all happy elsewhere, there was no need to keep it. Plus- it was simply too big for me. I’m glad to have had such a competent adviser (Maria Reiter) and am delighted that everything went as well as it did. We are really happy that Team Rauscher sold our apartment. We had an appointment with Mr Scharfetter some months ago and discussed the sale of our apartment. Working with Team Rauscher was great: the viewings were always announced in advance and everything was done very professionally. Many thanks to the entire Team for the great service! Team Rauscher did a great job. Mr Scharfetter carried out a non-binding valuation on our apartment a year ago. In the meantime we bought a beautiful terraced house through Team Rauscher and started the sales procedure for our apartment. All the necessary documents were drawn up and select viewings were carried out. The result is amazing: the apartment was sold to a lovely couple from Eugendorf within the space of just one week. Now we can concentrate fully on the move. Many thanks to Mr Scharfetter and the team! Ms Skazedonig cannot believe how quickly Team Rauscher sold her 3-room apartment. Mr Schwaiger is happy to have found just the apartment he was looking for. Putting my apartment on the market through Team Rauscher was the best thing I could have done. I am moving to Carinthia and wanted to wrap things up in Salzburg as quickly as possible. I still cannot believe how quickly Team Rauscher worked: everything was completed within the space of only 2 weeks including the handover! To top it all off a charming buyer was found. Finding the right apartment isn’t easy and I think it’s even more difficult in Salzburg. I’m really happy that I no longer have to look for property and have found the ideal 3-room apartment. Thank you to my excellent adviser Thomas Feichtinger who guided me in my choice once I had viewed numerous apartments. Team Rauscher made it possible! I had wanted to sell my apartment at the beginning of the year and contacted numerous property agents because I thought this would speed things up – but to no avail. I then had a very productive consultation with Mr Scharfetter and felt I was in good hands. Selective viewings followed and my apartment was sold within 3 months. It was a pleasure working with Team Rauscher. I didn’t have to do a thing! Many thanks. Team Rauscher did an excellent job. I’m impressed! To speed up the process I contacted Mr Scharfetter from Team Rauscher. I then exclusively hired Team Rauscher to sell the apartment. One of the huge advantages is the already established stock of clients that this property agent has. My apartment was sold to a lovely Team Rauscher client within 10 days. Thank you! I shall recommend you. A buyer for Mr Fritz’s pretty 3-room apartment in Puch was swiftly found through Team Rauscher. Because of my busy work life and very little free time, I decided to sell through a property agent. Following a first consultation with Mr Scharfetter, I exclusively hired Team Rauscher. Numerous viewings took place in order to find the right buyer. I can now concentrate fully on my new home. I am delighted by the sale of my apartment and congratulate Team Rauscher on their excellent work. Thank you for the professional service – it was a pleasure working with you. Michael Paul: I moved from the city to the countryside and am really glad that I opted for Team Rauscher to take care of the sale of my apartment. The advisers only showed my apartment to people who were genuinely interested. A buyer was soon found! Anton Lord: I am a very happy client and would like to thank my advisor, Thomas Feichtinger, for the excellent work. I went to Team Rauscher a couple of months ago. As a VIP client I immediately received information on the latest properties via email. Mr Feichtinger focused on my requirements so that on viewing only the 3rd property I found the apartment I was looking for. Thank you! We’d like to thank Team Rauscher for the professional service and fast work. Our son had been living in the 3-room apartment, and once he moved out we no longer needed it. We are really happy that Team Rauscher immediately found the right buyer for the apartment – a lady who, like us, bought it for her son. Team Rauscher Real Estate was recommended to me by a friend. Mr Scharfetter valued my apartment and explained the entire sales procedure. I then decided to opt exclusively for Team Rauscher. A team viewing by members of the sales and marketing teams followed. The apartment was sold to an already registered client within the space of only one week. I am delighted that everything went so quickly. The service I received was both highly professional and very friendly. Thank you to the entire team for the excellent work! We were really happy with Team Rauscher. It began with Team Rauscher’s Mr Feichtinger showing us the right house. The decision to buy this house ensued immediately. Following our decision, Mr Scharfetter from Team Rauscher came to value our apartment. A professional valuation was carried out and we opted exclusively for Team Rauscher for the sale of our apartment. It was sold to a lovely family within just a few weeks. The service we received was exceptionally good – also in comparison to other agencies. Thank you. We had tried to sell our apartment through another agency, but without success. We then made an appointment with Mr Scharfetter from Team Rauscher and immediately saw eye to eye. We were impressed by the perfect marketing strategy he explained to us. Around 20 viewings took place in 14 days and resulted in the sale of the apartment. Highly professional work with meticulous attention to detail was carried out every step of the way. Terrific job- many thanks! After talks with numerous other agencies we decided on Mr Scharfetter from Team Rauscher. We were impressed by the professionalism of both the sales and marketing team and found Mr Scharfetter’s services to be commendable! He reliably and competently took care of everything meaning that we were not involved in the sale. Our apartment was sold within 3 months. Thank you to the entire team! It all started with a property valuation by Peter Scharfetter, real estate expert at Team Rauscher. Following a professional consultation with Mr Scharfetter we were sure that we wanted to exclusively hire team Rauscher for the sale of our property. It only took a few weeks to find a suitable buyer. Working with the team was a pleasure and we didn’t have to lift a finger. Many thanks – you did a superb job! We are very happy with Team Rauscher: our property adviser, Maria Reiter, and her team were highly professional and found a new owner for our apartment within no time at all. We’re delighted that a lovely couple has fallen in love with our maisonette! I thought it would all be a lot more complicated! However, Team Rauscher was fast and did a great job. Thank you to Ms Lang and the sales team – I am really happy and can now move in with my partner! After a lot of deliberating we finally decided to sell out semi-detached house and move into an apartment. We’re not getting any younger! Ms Reiter, our property advisor, carried out a highly professional valuation of our property and the dedicated sales team then found the perfect buyer within only a few weeks. It couldn’t have been better! Thank you! We are over the moon! Mr Scharfetter carried out a non-binding valuation of our apartment about a year ago. We only just decided to sell the apartment and opted exclusively for Team Rauscher. 20 viewings of our apartment took place. They were well-organised and convenient for us. We didn’t have to lift a finger and everything was superbly done. The friendly and competent team sold our Thumegg apartment in just 2 weeks. It went a lot faster than we had expected. We will definitely be recommending you! Team Rauscher sold his gorgeous apartment in only a week! Ms Wimmer from the sales team was superb while we were looking for property. We received regular property updates and were constantly in touch. The sale of our apartment also went very smoothly. Mr Scharfetter valued the property, explained the process to us and arranged the sale. A week later our apartment was sold. A substantial and highly professional team which provides excellent customer service. Thank you! Professional, competent and friendly: We found our new flat after a lengthy real estate search with Team Rauscher. Ms Geiger from the sales team gave us excellent advice and within a few days we bought the flat. At the same time Mr Scharfetter paid us a visit to ensure a professional valuation of the flat. We hired Team Rauscher as our exclusive agent and it was the right decision: promptly a buyer appeared: the flat was sold in just one week. Should our interests lead us to cross paths again in future, we will gladly come back to you. Highly recommendable! I am extremely happy. It all went very well. We profited from the professional advice of Mr Scharfetter, who organized everything for us. Within one week the flat was sold. I want to say thank you for all the care from a very, very nice team. Many thanks to the entire team! I am really pleased that everything went so swiftly: well-prepared sales documents, a quick sale and competent final transaction. I was particularly happy about the assistance all the way to the signing of the contract. Here, everything functions in a very uncomplicated manner: Team Rauscher has already sold two other flats for me, and now for the third time I am very happy with the quick and competent transaction. I can only recommend you further! We’re thrilled! We now know what a real estate agent’s fee is, and that it is justified. We contacted various real estate agents in the past, but an interesting conversation with Mr Scharfetter convinced us to exclusively engage Team Rauscher. Mr Scharfetter organized the complete sale with his professional sales and marketing team. We didn’t have to do a thing, and we were always informed about viewings of the apartment. We particularly liked that we received written information about all transactions, and thus the sale was very transparent. We say a big thank you to you all, for the excellent work! We’re thrilled with the professional service we received. We were inexperienced and Johanna Lang informed and looked after us extremely well. Team Rauscher made us feel that we were secure and in good hands. Many thanks! We had a positive conversation with Peter Scharfetter and placed our full confidence in him. Team Rauscher took over the sale and it was the best decision. Our house was sold within one week. We’re very happy and will now travel the world. A big compliment to Team Rauscher! When we decided to sell our flat, we hadn’t made up our minds as to which estate agent we would use. After a conversation with Herr Scharfetter we chose Team Rauscher. A top professional estate agency: everything was taken care of, down to the last detail, we didn’t have to be concerned with anything. 2 weeks later the flat had been sold for a good price.We were particularly impressed with the fact that in these 2 weeks, there were 18 viewings and the successful conclusion was simply the result of the effort that had been put in beforehand. Absolutely super, thank you! Well done: I can only thank Team Rauscher and particularly the excellent advice of Johanna Lang for the fact that my flat was sold within 3 weeks to such a nice buyer.You’re a super team! It began with a realistic valuation by Herr Scharfetter from Team Rauscher. I generally place my trust in experts and I therefore decided to give the exclusive sale of the house to Team Rauscher. It was the best decision.Team Rauscher successfully made a sale within a short period of time. Particularly relevant for me, was the legal support in conjunction with the competent co-operation with a lawyer in the final transaction. I gladly recommend the team, good achievement! A pretty flat with a garden was sold within just one week. You can’t sell faster than that! Wonderful achievement by Team Rauscher! Everything went very swiftly, in spite of this a top professional standard was maintained down to the last detail. Herr Scharfetter visited us in our flat and all the necessary details were discussed.We exclusively engaged Team Rauscher and within one week, the flat was sold. Thank you to the whole team. Congratulations to Team Rauscher! It all worked perfectly – couldn’t have been better. Team Rauscher sold my apartment in Taxham for the full price within 3 weeks. I’d like to thank the entire sales team as well as Mr Scharfetter for the organization and super service. I am more than happy to recommend you! I had actually been intending to buy privately and placed an ad in the Salzburger Nachrichten. Mr Scharfetter was amongst the many callers who responded. Within a short space of time, we discussed and agreed on all the formalities and Team Rauscher launched its sales procedure. Within the space of only a week my apartment was sold without me having to lift a finger. Should I ever sell again, I will go straight to Team Rauscher. Thank you for everything. A friend recommended Team Rauscher to me. I am really pleased that everything worked so beautifully and that a suitable buyer was found. I appreciated Mr Scharfetter’s advice and was impressed by the superb service and professionalism of both the sales and marketing teams. Thank you! Family Schönlieb-Wesenauer: We are delighted to have finally found our new home through Team Rauscher. We can now quietly work on it and adapt it to suit our needs. Thank you Mr Malik for taking such excellent care of us! Family Pfeifer / Eitel: We are impressed. Team Rauscher sold our apartment in just 2 weeks! Johanna Lang took great care of us and the Team did a great job. Thank you! Great job! It was a good decision to exclusively entrust Team Rauscher with the sale of my apartment. Mr Scharfetter took care of the valuation and entire sales procedure. The apartment was sold for the full price within the space of only a week. The entire team were absolutely superb. Thank you! I am really thrilled to have found my first very own apartment through Team Rauscher. Looking for an apartment on the market had been very hard work, but then Mr Scharfetter from Team Rauscher found the perfect apartment for me! I can’t wait to move in! Thank you! Team Rauscher did a great job. We have known of Team Rauscher for a while now and decided to sell our plot in Elixhausen through them. Mr Scharfetter discussed all the details with us and within the space of only 2 weeks our plot was sold to a lovely family. Congratulations and a big thank you to the entire team! We are impressed with Team Rauscher! Everything went according to plan. Mr Scharfetter carried out a non-binding valuation of our property and we decided to sell exclusively through Team Rauscher 2 weeks later. An investor bought the apartment for the full price within only a few days. That enabled us to concentrate fully on buying our new terraced house in Fürstenbrunn – again through Team Rauscher. Ms Ganatschnig, the advisor for new property, did an excellent job. We are looking forward to our new home and would like to thank the entire team for their superb service! I am really pleased. Team Rauscher sold my apartment within 2 months. The sale was made possible without me having to lift a finger thanks to a realistic valuation of the property, carried out by Mr Scharfetter and a very dedicated sales team. It was a pleasure to work with Team Rauscher. I shall be happy to recommend you! Thanks to a very thorough consultation provided by Mr Scharfetter, I decided to sell my apartment through Team Rauscher. The whole team was very professional and customer-oriented. Owing to Team Rauscher’s large pool of existing clients, my apartment was sold to a lovely lady within the space of only 2 weeks. I would like to thank the entire team for their superb service. Keep up the good work! Your success says it all. I am THRILLED! Team Rauscher was recommended to me, so I contacted them. I had a good feeling about the whole thing from the very beginning. Mr Scharfetter gave me thorough advice on everything. He made me aware of legal aspects that I had previously known nothing about. On opting exclusively for Team Rauscher, everything went very quickly. Effective marketing material and a highly motivated sales team – result: my apartment was sold within the estimated time. Thank you to the entire team! Great job: Team Rauscher sold my apartment in Anthering in just a few weeks. It was really good that Mr Scharfetter was my point of contact and served as a representative of the entire sales team. I felt I was in good hands. I was also impressed by the fact that the initial time quoted it would take to sell the apartment was met and that I didn’t have to lift a finger. If I ever require assistance in real estate again I will definitely come back to Team Rauscher. Thank you to the whole team! I am impressed! Team Rauscher sold my property for the full price in just 2 months. The service provided by Mr Scharfetter and the procedure as a whole was very competent. In my opinion, Team Rauscher can call itself Salzburg’s most professional real estate agency. Thank you – I am more than happy to recommend you! A happy picture of buyer and seller at the notary: everything went well and we have now signed the sales contract. We’d like to thank Ms Geiger from the sales team and Mr Scharfetter from procurement for their professional service throughout. Thank you! Unbeatable! Everything began with a non-binding valuation provided by Mr Scharfetter. We were happy with the outcome and so decided to sell exclusively through Team Rauscher. It was definitely the right decision. Our house was sold to a lovely lady for the full price within the space of a week. The entire team was highly professional and very friendly. Many thanks. I would like to thank everyone at Team Rauscher. Our townhouse in Taxham was sold at a fair price to a lovely couple within the space of only two weeks. The sale confirmed that Team Rauscher definitely counts to Salzburg’s most successful real estate agencies. A big thank you to Mr Scharfetter for the excellent advice and service. We are more than happy to recommend you! Due to work-related reasons, I decided to sell my house in Anif . 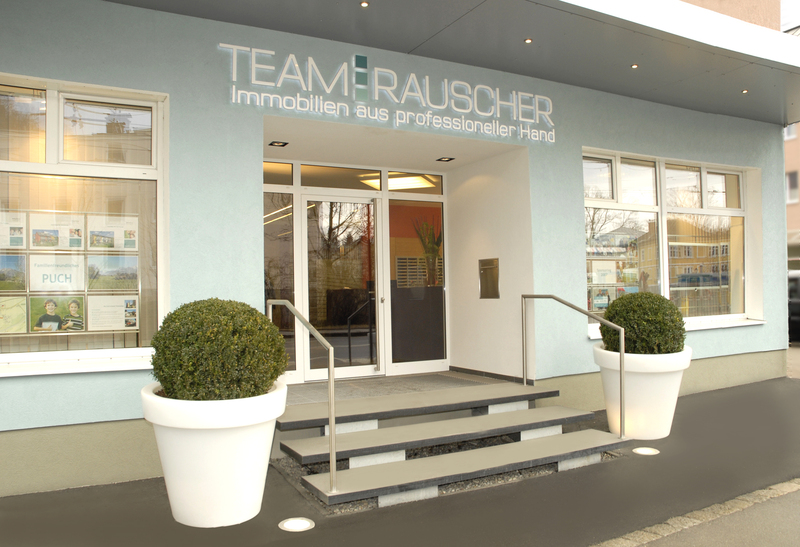 I headed straight for Salzburg’s most well-known real estate agency- Team Rauscher. On the very same day I discussed everything with Mr Scharfetter and gave Team Rauscher the job. A few days later, the highly professional marketing material for my house was ready. I was particularly impressed by the number of viewings. There were up to five a day! Within the space of only 10 days, my house was sold to some very friendly people. Thank you to everyone! You are true professionals! Working with Team Rauscher was an absolute pleasure. Everything went so smoothly! Thanks to Team Rauscher, we were able to sell our apartment very quickly. A big thank you to the very professional Ms Johanna Lang for taking such excellent care of us! We entrusted Team Rauscher with the sale of our 4-room apartment. The property wasn’t easy to sell so it took a little while. However, we were very happy with the way things went in the end. Many thanks to the friendly sales team and to Mr Scharfetter for his excellent service! Mission accomplished! Team Rauscher has sold our beautiful house in Großgmain as well as an apartment in Salzburg. It was a pleasure to work with the Team. Everyone was professional, approachable and friendly. We’d also like to thank our advisor, Mr Scharfetter, with whom we had regular contact. I am very pleased that Team Rauscher sold our terraced house in Hof. The Team was always very friendly, professional and committed. The number of viewings was also very impressive. I am glad I went with my gut feeling following the first meeting with Mr Scharfetter and that I entrusted Team Rauscher with the sale of our property. Thank you! It couldn’t have gone better: Team Rauscher managed to sell our 3-room apartment in Maxglan to a very nice investor within the space of only a week. Our advisor, Mr Scharfetter took care of all the preliminary matters whilst Ms Strobl from the sales team presented a suitable buyer. Super-professional, fast and well-organised: excellent work! Thank you to the entire Team! Tremendous work! We sold an apartment in the Josefiau through Team Rauscher. Mr Scharfetter prepared everything very thoroughly, then it all went very quickly. Within the space of a week the apartment was sold for a good price to a very nice buyer. The entire Team did a superb job. Many thanks! Great job! Initially we wanted to sell via an ad in the Salzburger Nachrichten newspaper. Primarily, we were contacted by real estate agencies who were interested in selling the property. Despite around 30 replies from various real estate agencies, we decided to go for Team Rauscher following our meeting with Mr Scharfetter. It was the best decision we could have made. The entire Team works very professionally and the house was sold for a fair price within the space of only a few weeks after an impressive number of viewings. Particularly worthy of mention: Team Rauscher does a superb job preparing the sales material and presenting the properties. Thank you to the entire Team! I always felt very well advised by Team Rauscher’s Ms Lang. That my apartment was sold so quickly, following its first viewing, was incredible! Incidentally, the timing coincided beautifully with the purchase of my new house. A big thank you to the entire Team, and especially to Ms Lang. A big thank you to the entire Team and to Ms Lang in particular, who took care of the sale of my property in a very friendly and professional manner. Excellent work. I am delighted by the positive outcome! I enjoy the odd purchase or sale of a property. In my opinion, Team Rauscher counts to the top players in Salzburg. I can highly recommend this innovative real estate agency. In my case, time limitations make excellent personalised service all the more important. Their absolute professionalism aside, I believe the Team succeed in providing just this. Thank you to the entire Team and to Mr Scharfetter. I look forward to doing further business with you in future! As we are now living in Vienna, we had to sell our apartment in Salzburg Parsch. Mr Scharfetter gave thorough advice on all matters and together with the whole Team provided excellent service. The Team took care of everything from professional handling of the sale to the superb follow-up work including accompanying me to the notary’s office and handover. Many thanks. I am delighted to recommend you! I’m impressed. I had worked with real estate agencies in the past but Team Rauscher really stands out. Everything was done very professionally and I didn’t have to lift a finger. The whole Team works superbly; every single one of my objectives was met. A big thank you to the entire Team and in particular to my personal adviser, Mr Scharfetter. Absolutely flawless. Perfect service marked by professional procedure from start to finish. I can highly recommend Team Rauscher to everyone. Thank you to Mr Scharfetter for the superb service. I can highly recommend Team Rauscher. Everything was done very professionally. We were given expert advice by Mr Scharfetter and he even had our property professionally cleaned. In the end, Ms Strobl sold our house for a fantastic price. I really appreciated the regular contact with Mr Scharfetter and the written feedback we received on the sales activities. Thank you! We are thrilled to have found our new home- a terraced house in Eugendorf. There is now plenty of space for starting a family. A big thank you to Gerhard Ebner for his expert advice throughout our search. We are very impressed by the very friendly and highly professional service we received from our advisor, Johanna Lang. The marketing department also did an amazing job – we hardly recognized our own apartment after their professional work! Team Rauscher’s Johanna Lang was very supportive throughout the entire sales procedure. I was very happy with her helpful advice, from the evaluation of my property to the sales negotiations. I always felt very well taken care of and am delighted by the result! Ms Curini Chiarelli sold her Josefiau studio apartment in just a few weeks. A big thank you to Team Rauscher’s Ms Johanna Lang who was very obliging and professional throughout the sale of my studio apartment. You are welcome in Rome anytime! At first I was rather skeptical: I had already been to two other real estate agencies. I couldn’t imagine what Team Rauscher would do differently to find a buyer. In the end I was convinced to give it a go by Mr Scharfetter and looking back, it was the best decision I made. Team Rauscher was more professional in every way: more viewings, highly qualified salespeople, professional marketing and first class sales documents. Thank you to the entire team and to Mr Malik, who sold the house. Gordana Banjac: I am really happy that I found my new apartment that I can design according to my wishes, through Team Rauscher. Team Rauscher’s Andreas Malik was very competent and friendly. Mr Malik- thank you for your time and excellent service! Clemens Csizmar: Team Rauscher sold my 2-room apartment in only 3 weeks! Mr Scharfetter took care of every aspect. This is the second time that I have sold/ bought through Team Rauscher. Should I sell or buy again in future, it will definitely be through Team Rauscher. You can’t get more professional than this. I sold my apartment through Team Rauscher in the space of only a few weeks without having to lift a finger. Mr Scharfetter took care of everything right up to the signing of the sales contract. Thank you! I will recommend you in future! Things couldn’t be better! We are very happy with Team Rauscher. On the one hand Team Rauscher found the house of our dreams, whilst the sales team sold our apartment for a superb price in only a week. It was great working with Team Rauscher. Thank you to the entire team! Without having to lift a finger, the sale of our apartment was carried out very professionally by Team Rauscher’s Ms Lang. A big thank you from us! I found Team Rauscher by lucky coincidence. The entire team was always very professional and committed. The sales documents were superbly prepared and all viewings were carried out to our satisfaction. I received written feedback after every viewing which kept me up to date. Highly recommendable! Thank you to the entire team! Team Rauscher very professionally sold my apartment in only 2 weeks. I felt very well taken care of and found the whole team very friendly and competent. The expose was very good and to the point. I can only but recommend Team Rauscher! 100 points to Team Rauscher- everything went so well! The whole team was always friendly, well-organised and very professional. My contacts were always there for me, I always got feedback regarding viewings and was even given a written activity log. I can strongly recommend Team Rauscher to both buyers and sellers. A big thank you to the entire team! I would like to take this oportunity to thank you once again for continually sending me information. You know exactly what I’m looking for and the prospective objects you send me always hit the mark. Thank you! I think the service you offer is extraordinary. Money should be well invested – especially in times like these. That’s what prompted our decision to buy a wonderful 2-room apartment, which we are now renting out. We had contacted a number of real estate agencies but found the right property with Team Rauscher. We went for it immediately! We were impressed by the offer and by Team Rauscher’s professionalism, reliability and friendliness. Mr Scharfetter took care of everything from start to finish including the handover and renting the apartment out. Thank you! I am delighted that Team Rauscher was able to sell my top floor apartment in Gnigl in such a short space of time. Thank you for your hard work and dedication. I am very happy with Team Rauscher’s work! I am more than satisfied! I was able to sell my terraced house in Anthering in the space of a week. I felt very well taken care of by Team Rauscher and by Mr Peter Scharfetter. Many thanks! Team Rauscher took excellent care of us while buying our house and then while selling our apartment. We were never put under any pressure which made working together great. We were able to receive updates on the progress being made at any time and were always treated in a friendly way. They are an all-round competent team! Thank you! We wish you many more satisified clients! I am very pleased. Team Rauscher showed great dedication and reliably sold my property. The whole team is good and does excellent work. They took wonderful care of me. I have known of Team Rauscher for many years now and approached them one day. I had heard from a number of sources that Team Rauscher offered excellent service and did great work. Thank you to Mr Scharfetter who brought about the sale of my property. Dr. Thomas: I spent a long time trying to find the right property before I found my new apartment at the heart of the Andräviertel through Team Rauscher. A big thank you to Team Rauscher and Mr Scharfetter for their good work! I recommend them! Mr Schön: I am delighted that Team Rauscher found such a nice buyer who will treat ‘my’ apartment well. Team Rauscher was very dedicated, professional and reliable. Thank you! I felt like I was in very good, professional hands with Team Rauscher! Superb and highly recommendable! I saw a Team Rauscher ad in April and decided to give them a call. I viewed the apartment on the same day and decided to buy it then and there! The sales offer was signed immediately and in the meantime the sales contract has also been signed. Everything went smoothly without any hiccups. Many thanks to Team Rauscher and Mr Scharfetter for their excellent work! I became aware of the three-room apartment in the middle of April and bought it at the beginning of May. I am delighted with the apartment. Everything went so quickly and smoothly without hassle! I am very happy with the professional service I received from Team Rauscher. A special thanks to Ms Weber-Mittermair!. I am thrilled! Team Rauscher sold my three-room apartment in Leopoldskron within a week! I am delighted and staggered by how smoothly and quickly everything went! Many thanks to the friendly, professional team. We decided to buy a semi-detached house through Team Rauscher at short notice. Everything went very swiftly and smoothly. Initially Mr Scharfetter clarified important details, then organised an appointment with the building contractor who was very flexible. We can have our say regarding fixtures and fittings and the overall composition. We are looking forward to our new home! Thanks to Team Rauscher we were able to find a superb city flat in Riedenburg within the space of only a few days! Peter Scharfetter made this possible by only showing us flats which fit our search profile, and that at very short notice. This saved time and effort. Many thanks for your friendly and professional assistance! We recommend Team Rauscher. Mag. Gernot Sagburg: I am surprised that my apartment was sold in only 4 days! Josef Haas: I am absolutely thrilled about the purchase and would like to thank Mr Scharfetter for his pleasant handling of the matter and care! I sold my garden apartment in Aigen through Team Rauscher within the space of 4 working days. This topped my expectations which had already been very high based on what I had already heard about them. I was impressed by their friendly and approachable manner and their professionalism. I highly recommend Team Rauscher! Found a fabulous 3-room apartment in 3 days! We had been looking for the right apartment for over a year but hadn’t found a thing. Within the space of only a few days we found an apartment through Team Rauscher, viewed and signed the deal in only 3 days! Mr Scharfetter was very approachable, professional, thorough and even accompanied us to the notary. We are delighted to have bought our apartment through Team Rauscher. Thank you! On moving into our new terraced house, which we purchased through Team Rauscher, Mr Scharfetter also sold our apartment. The entire team was always very dedicated, attentive, reliable and professional. Team Rauscher is brilliant! Not even a month had passed when I found a suitable 2-room apartment through Team Rauscher. It all came about very quickly and easily and I felt very well taken care of. Numerous real estate agents had tried to sell my apartment but without success. I then turned to Team Rauscher and was thrilled: within the space of 2 weeks my apartment in St. Leonhard was sold. I was very attached to my apartment and was happy that Team Rauscher was able to find such a lovely buyer. Sold his apartment within 3 weeks. I am delighted: my three-room apartment in Eugendorf found a buyer in just 3 weeks! Many thanks to Ms Weber-Mittermair! Many thanks for your flow of up-to-date information. We have just found a building plot being sold privately that suits us perfectly and are therefore no longer searching. I would like to thank you for your informative and highly interesting offers and compliment you and the entire team on being Salzburg’s most professional (and friendly) real estate agents. Without a shadow of doubt! I came across Team Rauscher Real Estate on the Internet and was impressed. I’d like to mention their professionalism in particular; they stuck to every appointment! Ms Mittermair identified which kind of apartment suited us best and thanks to this, we were able to find an apartment in only 26 days! Ms Mittermair of Team Rauscher Real Estate helped me sell my apartment in a short space of time. I found Team Rauscher to be very competent, polite and friendly. I am more than satisfied! I was delighted with the friendly supervision from Team Rauscher. I felt that I was in very good hands! I very much regretted having previously commissioned another estate agent. Nothing happened for half a year. Then I went to Team Rauscher and the house was sold within 10 days. I am absolutely delighted. It is a huge relief for me to have sold the house now. I am also very happy that I dared to make the step and that I renovated the house. Today, I am selling the house with pride and a very good feeling. The next challenge awaits me. Somehow, I still can’t quite believe my luck in this positive turn of events. I would also like to say thank you for the pleasant collaboration with Team Rauscher. I can only recommend them. I have seldom met such nice and professional people in this area – and also very friendly. I think we should raise our glasses to this. We will see each other again. You had already tried to sell the apartment yourself and had also assigned another estate agent. How did you find out about Team Rauscher? It is difficult to find out whether potential buyers for an apartment really want to buy, or whether they are just observing the market. The other estate agent had also made six appointments without success. It was just the amount of time involved that bothered me; you are also missing a lot of information that you have to then get hold of. It was then that Team Rauscher was recommended to me. How did the sale of your apartment then progress? I would like to start by saying that the entire sales team is extremely friendly. This isn’t something to be taken for granted nowadays. I didn’t have the slightest concern about leaving the key to my apartment with the property consultant so that she could view the apartment on her own. Team Rauscher sold the apartment within six weeks after two viewings. The price was just right and, furthermore, the solicitor even accompanied me to the appointment. Would you sell through Team Rauscher again? Yes, I am happy that it was wrapped up so quickly. Furthermore, I have already recommended my consultant to someone else. Mr Pacher, on account of your professional background, you are very familiar with real estate. Why did you decide to sell your apartment through an estate agent? I did this once myself and know how laborious it can be. Even if you are well-acquainted with real estate, it is still very time consuming. Especially from the moment that you have placed an advertisement. You have to continually be available by phone, and continually show potential buyers through the apartment. A work colleague recommended that I try Team Rauscher. How was the handling of the sale? I only had three appointments with Team Rauscher. At the end of January 2007, we discussed the assignment at a first meeting. My idea of price was similar to that of the consultant. Immediately after this we had a photo appointment in the apartment, where the sales team also had a look around. The apartment was sold just two weeks later. On 14 February, we already had the appointment with the buyer. I never imagined that it would go so quickly! I would definitely recommend Team Rauscher to anyone else.